Super great service! And great products! Excellent product! Fast & well packed. Save time & money w/this nice kit. Worked great for my 1g DSM front turn signal. When I got my car it had a broken connector and a missing bulb holder. I found a set of lights that came with the bulb holders but I ended up breaking the connector further. This one just needed soldered or crimped into the same spot as the old one and it plugged right in. Though it is not a factory product, it was made from two of the OEM components. It worked well. Earlier when trying to change the Front Right Marker lamp, I damaged the wire right on the socket. So had to replace it. This was a perfect fit. 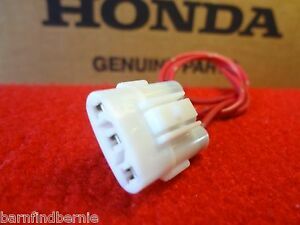 Corrosion ruined the socket and Honda only sold the connector but not the part attached with the harness. You would have to buy the complete harness to get the end. Ebay to the rescue. This is exactly what was needed and worked perfectly. I’m very happy with the Honda Socket Connecter!